HEB, one of the largest grocer chains in Texas, wanted to differentiate from the competition as the grocer and employer of choice. 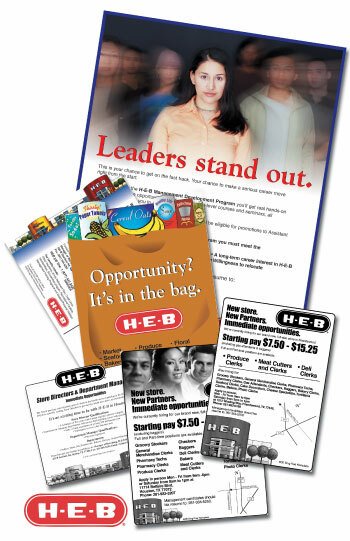 Standard recruitment newspaper ads were the center of the campaign focusing on the convenient locations of the stores and HEB's higher wages. A dye-cut grocery bag postcard was designed to feature new job opportunities, and due to its unusual shape as a direct mail piece it was huge success.